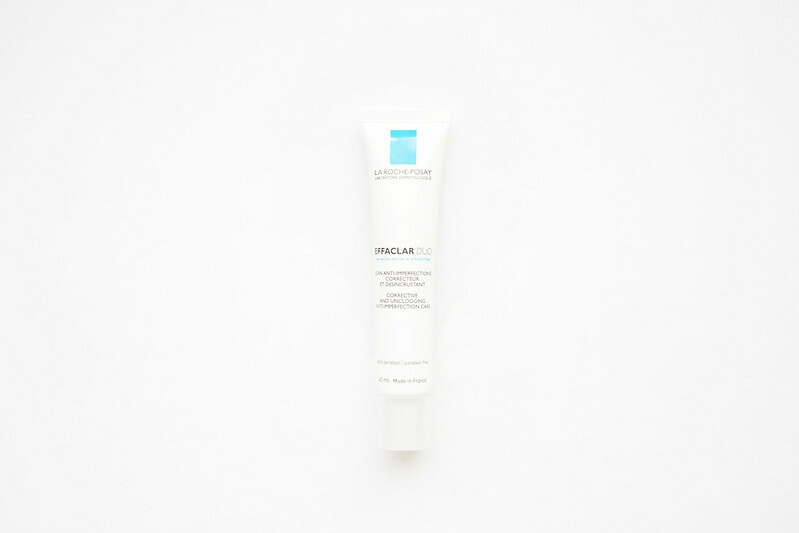 La Roche-Posay Effaclar Duo is described as a dual action anti-perfection moisturiser for oily skin with irregular texture; containing niacinimide, piroctone, olamine, and LHA to help reduce skin imperfections and help prevent blocked pores and the development of future breakouts, leaving the skin looking clearer and smoother. Personally I'd describe this as more of a serum than a moisturiser, the texture is thin and feels slightly tacky on the face while the smell is noticeably chemically, which is understandable considering the ingredients and the purpose of the product. I apply La Roche-Posay Effaclar Duo mainly in the evenings after a full cleanse and applied with a light moisturiser over the top. Occasionally I'll apply it in the morning beneath make-up if I'm feeling concerned about the condition of my skin. I don't suffer an oily complexion or enlarged pores, instead I use La Roche-Posay Effaclar Duo to prevent and protect against breakouts. I find when I use this in combination with La Roche Posay A.I. any breakouts, blemishes, or cystic spots diminish and disappear far more rapidly. La Roche-Posay Effaclar Duo definitely helps repair the skin, reduce redness or irritations, and protect against developing breakouts. La Roche-Posay Effaclar Duo doesn't have quite such a dramatically noticeable effect as Effaclar A.I. Targeted Breakout Corrector but it's definitely a product worth investing in as a preventative measure against blocked pores and skin imperfections. I just ordered some of the AI stuff online after having one huge THING on my face the whole time I was in NY. I thought I could get it cheap stateside but it was SO expensive. I'm excited. thanks for this! i love the effaclar cleanser but haven't tested anything else from the line. i am looking into a new shower gel.. any suggestions? i was thinking maybe something by roger gallet -- but i can be persuaded! It is a MIRACLE WORKER. I don't know how I lived without it. Korres Cinnamon Vanilla Shower Gel smells divine and also LUSH Rose Jam, although it's expensive for the amount you get. Either of those are amazing. Hmm, I can see how it could do that.. were you using a moisturiser over the top? I don't apply this every day, especially since my skin feels and looks better and I always make sure to put moisturiser on over the top - probably more than usual - to counterbalance any dryness. Why didn't it work for you? UGH that's a real shame. My skin has never been better since using it, I guess some products just don't suit everyone! I got this after reading rave reviews by many bloggers but it didn't work for me at all - I broke out in many small spots! Effaclar K worked for me though I'm not using it anymore.